All postings on this blog are provided “AS IS” with no warranties, and confer no rights. WordPress Blog posts by miguelpdl. The Internet of things, but where do they go? The Chumby, an interactive mediaplayer that streams content from the Internet into chumby widgets. They’re not offically shipped to my home location so I picked one up from ebay and I must admit it got here quick flash (excuse the pun Chumby uses FlashLite for the widgets). Now you can read the hype over and over, and I did and starting to believe it, until I got my hands one. Now don’t get me wrong, it looks great, and you can connect it to accounts on flickr, twitter, facebook, picasa, urban quotes of the day and you can stream internet radio and I thought all these features would be great ….. but the first problem I found is that it is really a glorified alarm clock, and with the fact that there is some distance between my wifi router and the bedroom the Chumby just wouldn’t connect to the network and when the Chumby cannot connect to the network its just unusable ….. even as an alarm clock. I moved things around, got a signal in the bedroom and after a week I realised the Chumby was getting no eye time …… I go to sleep in the bedroom, read books/magazines if I get the chance but sitting beside my bed waiting for the Chumby channels to change just isn’t compelling enough, so I decided to move it to the living area. First to the living room …. after 1 week nope, no good the TV already takes all the attention. 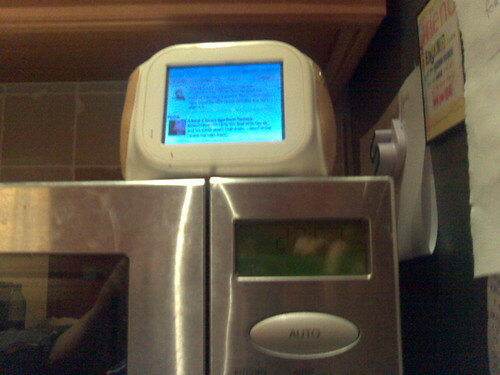 On top of the microwave in the Kitchen ….. perfect it’s lasted 2 months and gets more passing glances morning, evening and late at night. And for me the best widgets on Chumby, are the FaceBook photo feature, which displays friends pictures once they push them out and the Yo Mama is So Fat jokes widget. © Miguel Ponce de Leon 2005 - 2018. All rights reserved.